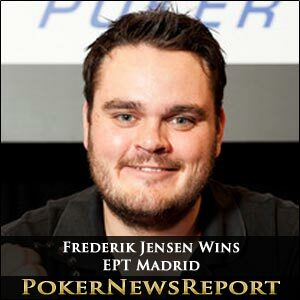 Danish poker player, Frederik Jensen, made it a Dane Double late on Saturday night in Madrid, as he took down the PokerStars-sponsored EPT Madrid Main Event to emulate the performance of his friend and compatriot Mickey Peterson – the player who took a home town victory in last month´s EPT Copenhagen Main Event. However, whereas Peterson had to endure a six hour heads-up marathon to claim his title, the climax of the EPT Madrid was as brutal and as rapid as the preceding five days. The final day had started with last-Spaniard-standing – Ricardo Ibanez – well in control with a massive chip advantage over Jensen and Scotland´s Fraser Macintyre. Spanish hopes of a first ever EPT winner remained high throughout the first few levels despite Ibanez playing like a sieve, and it was his generosity that kept the game alive for the three short stacks at the final table – Ilan Boujenah, Jason Duval and Nicholas Levi. Jason Duval, who had qualified for the EPT Madrid via an online poker satellite, was the first to depart – shoving with 7♥ 7♣ into Andrei Stoenescu´s A♥ K♦ and seeing the A♣ first out on the flop. As so often happens on final tables, when one goes others quickly follow, and Duval´s footsteps to the cashier were soon being trodden by Nicholas Levi (lost with K♠ Q♦ v 7♣ 7♦ of Bruno Lopes) and Ilan Boujenah who, despite making two pairs with his A♠ J♠ could not catch up to the flopped straight of Bruno Lopes (K♥ Q♥). Ibanez had been playing pretty much the same way as on Friday, but without the results/luck. He was playing hands that most players would have laid down as soon as they were dealt and, in one such hand, relinquished the chip lead to Fraser Macintyre when playing 3♥ 6♠ (the 3♥ paired on the flop) all the way to the river against Macintyre´s A♦ 9♣ (The A♦ also paired on the flop). Macintyre remained as chip leader through the early eliminations until running into Andrei Stoenescu´s straight flush cost the Scot 1.5 million chips. Stoenescu increased his chip advantage with the elimination of Ricardo Ibanez who, in typical fashion had shoved with A♥ 2♦ on a flop of Q♥ 2♥ J♣. Unfortunately for the Spaniard´s supporters, Ibanez was called by Stoenescu who has holding Q♠ Q♦ and that was the end of the dream for a Spanish winner of an EPT Main Event. Meanwhile, Jensen – who had been left as short stack after the four previous departures started a run which saw him take a million chips from Fraser Macintyre in a A♥ K♥ v A♣ 10♥ race and crush Bruno Lopes when his 6♣ 5♥ found two pairs on the board to master Lopes´ K♣ K♦. Lopes was soon to lose the remainder of his chips to Stoenescu, after which a three-way deal was agreed upon which saw Jensen guaranteed €385,000, Stoenescu guaranteed €330,000 and Macintyre guaranteed €290,000 with €110,000 to play for. Stoenescu did not stick around for long to get involved for the extras – quickly losing a chunk of his stack to Macintyre and then calling Jensen´s shove (6♠ 7♠) with K♦ 8♥ on a flop of 5♠ 8♠ 10♦. Although the K♠ on the turn gave the Romanian two pairs, it also completed Jensen´s flush and, with the Q♣ on the river, the game was now heads-up. Jensen went into the Heads-Up with almost a 2:1 chip advantage, and that quickly became a 4:1 chip advantage when he rivered a straight in the second hand of the duel. Whereas EPT Copenhagen Peterson had to battle through six hours of heads-up play, Jensen wrapped his game up in six hands – the conclusive one being when Macintyre shoved with A♦ 9♠ into Jensen´s A♣ 10♥. With no 9 on the board to help the Scotsman (who incidentally qualified for the tournament through the PokerStars “Steps” SnGs), Jensen became master of Madrid, collected a cheque for €495,000 and the title of EPT Champion.